What do you travel for? To open your eyes to new places and experiences? For the exhilaration of unexpected encounters? To satisfy your hunger for culture--or maybe it’s straight-from-the-source, regional flavours you crave? 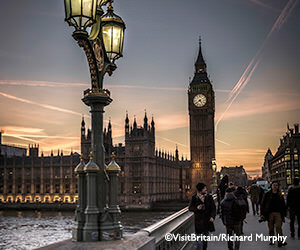 365 days a year, travel to Britain gifts lucky visitors with the experience they’re after. Not to mention, rewarding ones they didn’t expect. Prepare to be amazed by the diverse opportunities, activities and beauty of this multi-faceted and must-see destination. 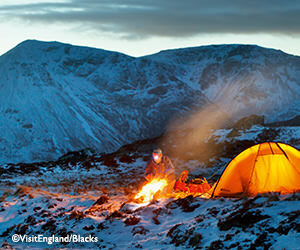 Great Britain travel leads to greater life experiences. As Canadians, we love how relatively small Britain is to our vast land. A few short hours and fantastic train and road systems enable scenic access to other must-see British travel destinations. Those of us who love listening to Liam Gallagher, New Order, The Smiths, or those who admit to being hooked on Coronation Street, must make a stop in Manchester. If you're more of a Beatles fan, travel to London and take an iconic walk along Abbey Road, or better yet, why not visit the Fab Four's hometown of Liverpool? If London travel is on your radar, as it should be, consider making England's capital city the gateway for other British travel opportunities. Whether you are travelling to London for the first time, checking out Birmingham’s eclectic food scene, tracing your ancestral roots in York or ready to surf the crashing waves of Cornwall, enlist our expertise. Britain’s indelible imprint on ancient civilization and modern culture attracts visitors from around the globe. 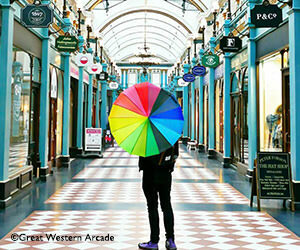 Why not see more, with Flight Centre’s multi-city flights to Britain? It's like paying for a flight to London, and getting to Edinburgh and Glasgow for free! Or, fly to Manchester and we’ll arrange rail passes to Birmingham and beyond. But enough about why we love travel to Britain. Book our cheap flights to Britain and carefully-curated packages to discover it all for yourself. Our favourite time to visit the UK is the spring. In April to June, famous English country gardens are in bloom, many Scottish guided tours begin, prices are lower and crowds fewer than the high tourist season. Weather in Britain is at its finest during July and August. This also means peak tourist season, with higher hotel prices and denser crowds. Winter is the low season, with a spike in mid-December to early January due to Christmas and New Year. The winter season, while never too cold or snowy for Canadians, is full of light and cheer with a collection of holiday festivals and markets to experience throughout Britain. Millions of visitors a year can’t be wrong. 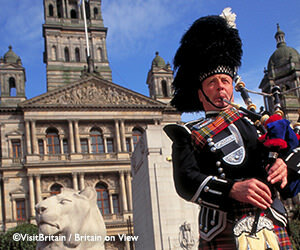 Britain is many destinations all in one beautiful, historic, enthralling and delicious package. Efficient air and rail transport and comparatively small size make Great Britain travel easy. Why not check out a few cities in one trip? Iconic architecture, charming country and coastal towns, cool cities, exciting nightlife, important museums, outstanding galleries and incredible hotels. (We’re almost out of breath just saying that!) Now, get ready for Britain to take your breath away, whether it’s you first visit or tenth. Thanks to its incredibly extensive railway system, Great Britain travel is easy. With over 2,500 train stations across Britain, you can explore cities and admire countryside across England, Scotland and Wales in the comfort and convenience of a train. Why not check out a few cities in one trip? Foreign travel to London accounts for the most tourism in Europe. London sets the world-class city benchmark. The sprawling London Underground transport system efficiently takes you where you wish to go, day or night. Go beyond the famous landmarks – the more you dig for unexpected surprises, the more London rewards you. This fun and friendly city in the English north has some of the best rail links in the country. Satisfy your thirst for history with a city walking tour-- or your thirst in general, at one of Manchester’s famous breweries or pubs. Immerse yourself in Manchester United footy fandom, or immerse yourself in culture with day escapes to local and tourist favourites alike: Lake District, Yorkshire and York, Liverpool, and Chester -- all a quick train ride away. Fly into Birmingham and get ready to enjoy one of Britain’s most multi-cultural cities. Often overshadowed by Manchester and London, Birmingham is not to be overlooked! If you’re ready to go outside of the must-see museum and gallery checklist, whimsical Birmingham delivers the unexpected, with quirky museums and tours. Birmingham is your gateway to the beautiful Cotswolds, Stratford, and the Peak District. 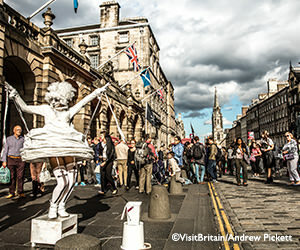 Edinburgh, the capital city of Scotland, showcases a wealth of British history with a distinct regal flair. Stroll the Royal Mile from Edinburgh Castle to Holyrood Palace, or explore the booming craft gin industry of Scotland where 70% of the UK's gin is made. Glasgow, situated on the historic River Clyde features stunning architecture, beautifully-curated galleries, vibrant nightlife and is the gateway to dramatic Scottish landscapes.Glasgow’s location lends itself to its culinary talent and ability to source all local seafood and produce, creating a cosmopolitan dining scene throughout the city. With nonstop and direct flights daily to London, Manchester, Birmingham and more, Britain is easy to get to. Thanks to one of the world’s best rail systems, it’s also easy to get around. Ask us to book your BritRail passes, the most cost-effective way to explore Britain. A BritRail pass lets you travel whenever and wherever you wish along the national rail system, from Scotland’s Northern Highlands, to the English Channel in the south. While train travel is the most affordable and simple option, your Flight Centre can also arrange self-drive for independent travel, or find you an escorted tour to Britain with your name on it-- whatever you travel for.